Another reason i heart yard sales. Seriously, i am plain ol’ a-d-d-i-c-t-e-d to them. I can’t help it, there are just soooooo many bargains out there just waiting for people like me (and prob. you). 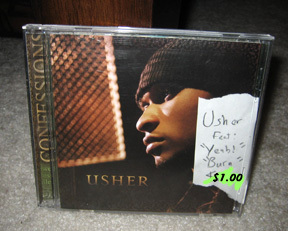 I had totally forgotten about this until today, but I found a cd that i actually LIKE (and don’t have) for only 1 buck!!! How awesome? It’s too bad i was in a rush, or i woulda looked for more. Next post: It’s a WOOT OFF!! !